Tell the graduate in your life to spread their wings and soar. Handmade graduation card ideas like this are so unique. Anyone can use more clever ways to say "Congrats, Grad!" and this card is fabulous for inspiration. 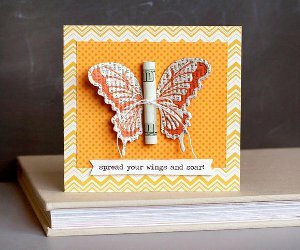 The Spread Your Wings and Soar Butterfly Card uses a Fiskars butterfly punch and features a creative way to include a monetary graduation gift. Butterfly embellishments are perfect for spring and summer and thus perfect for graduation cards. 1. Begin by creating a folded card to fit your envelope. You can use book pages for these cards to go with the school theme, but you can also use any cardstock or patterned paper you prefer. Once you have your base ready, you can begin decorating. 2. 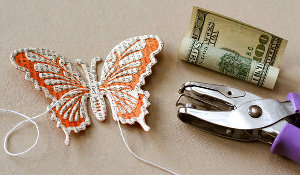 Butterflies are a favorite embellishment and work well for a creative money holder. Here you can replace the body with a rolled up bill for the graduate. Adhere a book page to a piece of cardstock to add thickness for letterpressing. 3. Run it through the Fuse Creativity System® with a butterfly die using orange ink. 4. Use a 1/16 inch hole punch on each side of the body to thread string through for tying on the rolled bill.